Verse Rule: ABILITY: Add (S)(S) if you sacrificed another Fasting verse to play this verse. Another is: D&C 59:14-15. That one says this: “Verily, this is fasting and prayer, or in other words, rejoicing and prayer. The whole point of fasting is that it should be a joyful gift. Part of making it a joyful gift is doing service while fasting. Give up your own food and comfort, and take care of someone else’s needs. That includes, obviously, a generous fast offering, but it can also be more direct service and gifts of time and effort. 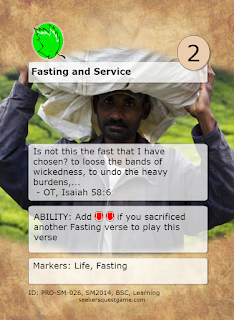 This verse is also in the fasting deck that I made and offer. The idea of the deck is to have 3 copies of each other fasting verse, and other verses that help return verses from the discard. In that way, you can accelerate your own icons to complete books and receive blessings! 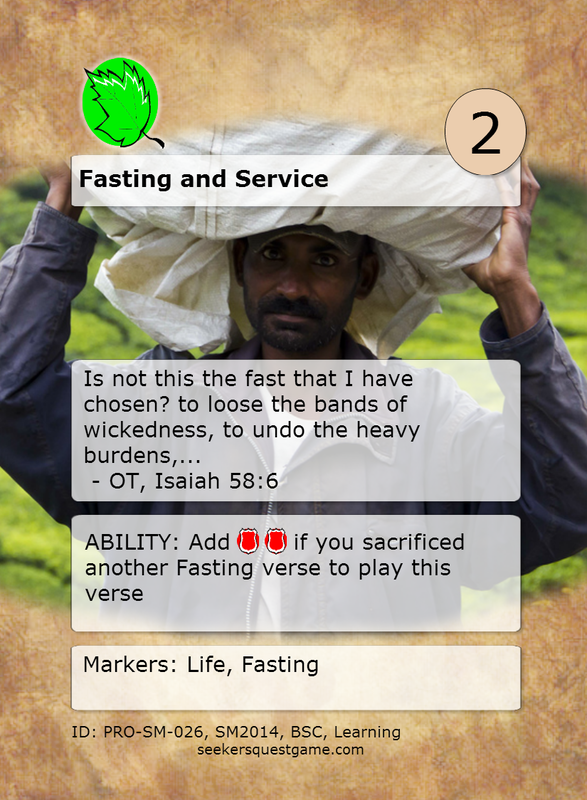 This verse may be found in the Learning Game set, the Fasting Deck, and the Scripture Mastery Set!